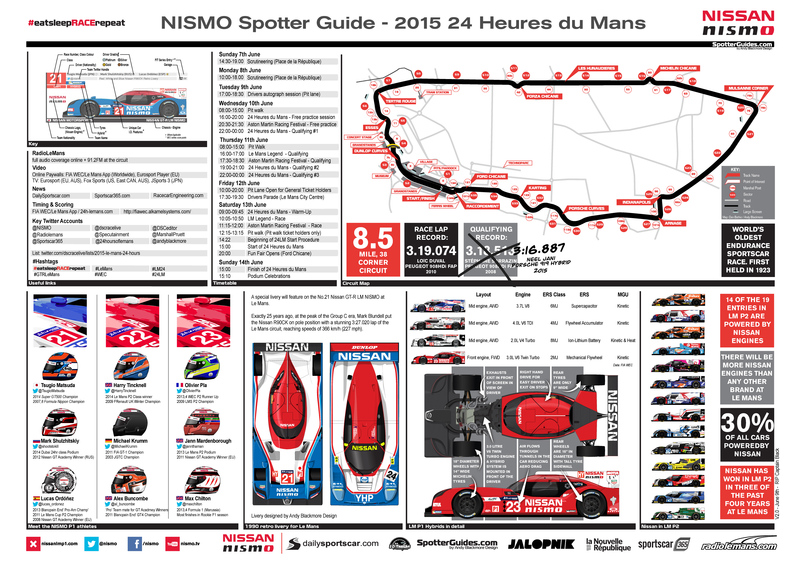 Version 2.2* of the NISMO 2015 24 Heures du Mans Spotter Guide is now available as a free download. The guide features all 56 cars,driver, team and engine details along with FIA driver grading, Twitter handles, tyres and even the pit garage where each car is located. 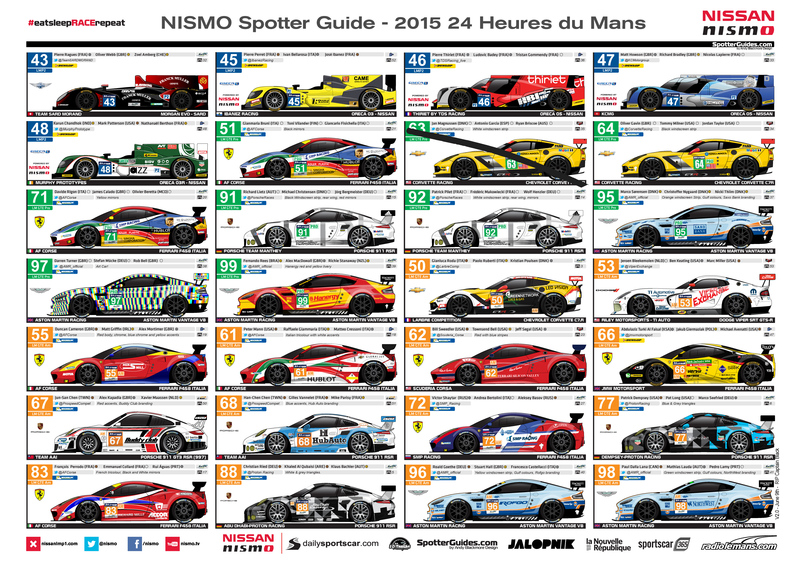 In addition the popular third sheet will include a timetable, map and helpful links and is the perfect tool for watching at the circuit or from home. Version 2 of the guide (full change list below) features new liveries for #95 Aston Martin and revised designs for the #66 JMW Ferrari and #68 Team AAI Porsche. As in previous years, we will be releasing two formats, a Landscape (A3) 3 page version and with Version2, an additional Portrait (A4) version, as shown above. A3 is perfect for larger printing or viewing on desktops and tablets. The A4 is useful for home printing and cellphones. To assist those going leaving early for Scrutineering this weekend, Version 1 of the guide was released earlier than usual. Version 2 was released post scrutineering, Full change list below. 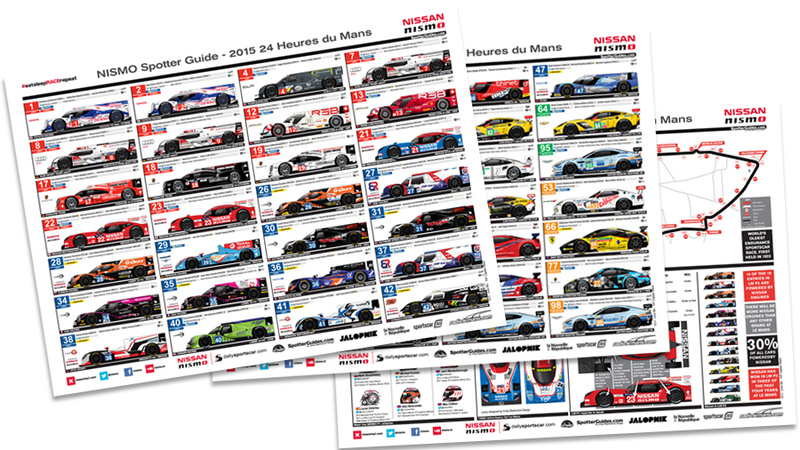 The guides will then be updated throughout the race week with any significant changes. 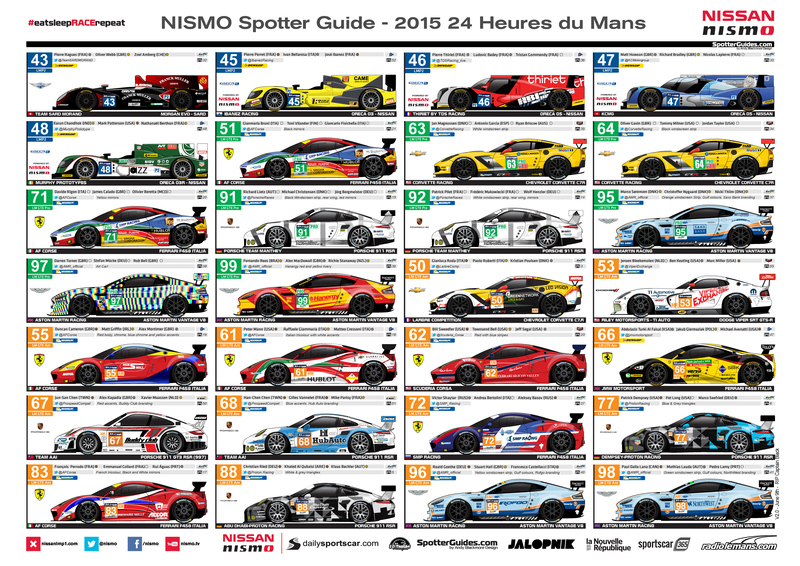 In addition, French regional newspaper La Nouvelle République, will be printing a cut down version of the (v1) guide in Tuesday’s issue as part of their Le Mans preview. Thank you for the media partners who help to spread the word including DailySportsCar, RadioLeMans.com, Jalopnik Sportscar365 and hosts, Ten-Tenths who all support and promote the guides. Also, special thanks to the proof readers who volunteered their services. Shea Adam, Marcel ten Caat, ‘Racer Keke’, Jake Yorath, Adam Prescott and Mike Juergens. Additional thanks to DSC’s David Lord and Marshall Pruett for images ‘on the ground’ which ensures we are up to date. Additional thanks to everyone who has downloaded any of my guides this year, as a fan, team personnel, commentator, race event staff or marshal. Thank you all very much! It is with great sadness I heard of Photographer David Stephens passing yesterday (Monday). David often supplied reference images to me for the Spotter Guide in past years and he was one of the most liked, most approachable guys in the paddock. Always had time for you, always a smile, always a gentlemen. Condolences to his sister, Deborah, family and his extended family in GT and Endurance Media. RIP Captain. 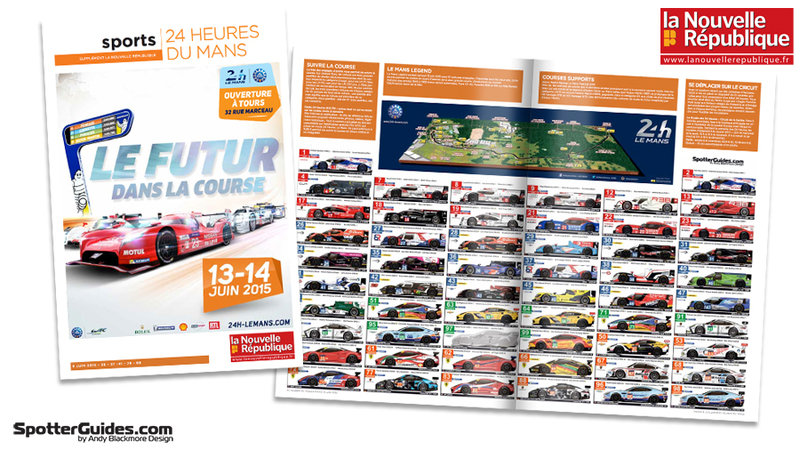 Finally, a reminder of the 2015 Racing Wall Planner with all the major race dates…. and many minor ones is also available. 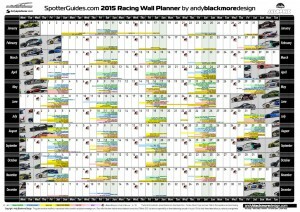 Hop over to the Wall Planner Page to download yours, or order a large print. Please fill free to share the guide on Social Media, but please link to this page and not the guide (as file names change with updates) so your friends and fans can download the latest version of the guide! 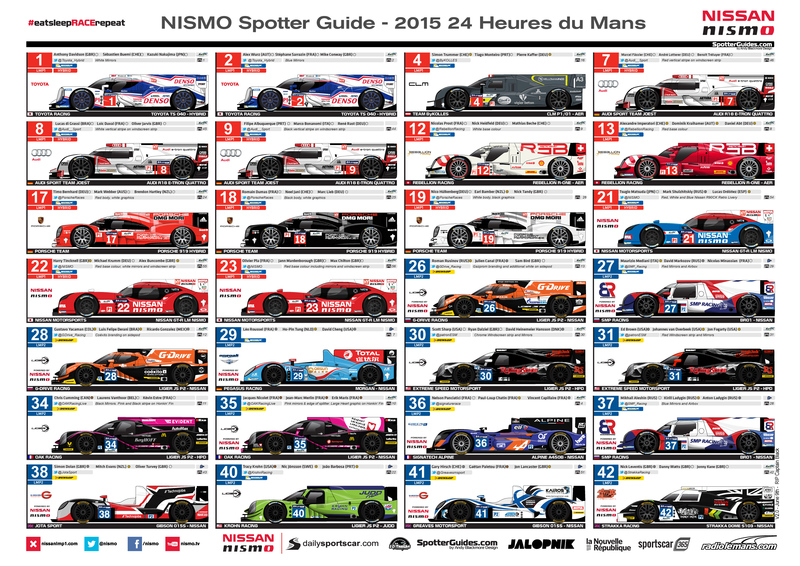 This NISMO sponsored Spotter Guide is not affiliated with the 24Hours of Le Mans, FIA World Endurance Championship, European Le Mans, ACO or any other organisation, event or entity associated with the series. The guide is an unofficial resource.